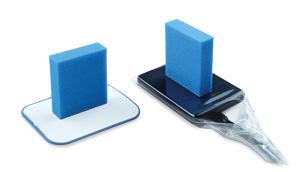 Simple, self-sticking foam tabs attach quickly and are easy to position. 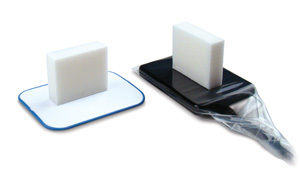 Cushioned tab holds film or sensor securely, allows full occlusion and provides visual reference for accurate placement and alignment. Well-accepted by both children and adults. Soft cushioning, without hard surfaces, provide the ultimate in comfort and helps minimize gagging. Use-and-toss convenience—extremely cost effective too! Made of soft polyethylene foam. 100% latex free. Film Flaps require snug-fitting sensor protective sheaths! Flaps come in two sizes, Original and Long. Both can be used on either film or a sensor. Be sure the protective sheath for the sensor is a snug fit. 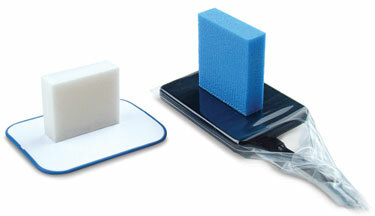 White self-sticking foam tab is the smaller size. It is 15/16" wide x 13/16" high x 1/4" deep. Blue cushioned tab is 1/4" longer. It is 15/16" wide x 1 1/16" high x 1/4" deep. Flaps are perfect for horizontal or vertical bitewings. Excellent for any periapical, using parallel or bisecting angle technique. Accommodates all #0, #1 and #2 film and sensors. Required: snug-fitting sensor protective sheaths! 1. Stick the Flaps to the back of the film or sensor. 2. 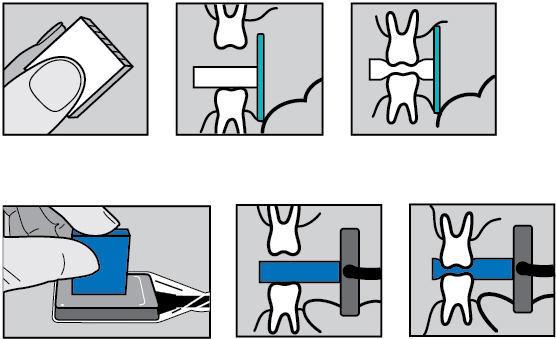 Position film or sensor in the mouth for the desired position. 3. Tongue presses against back of film or sensor and teeth bite into center of the Flaps. "I really wish I had thought of this great product." "Flaps, (Original), are very soft, yet supportive. Patient comfort is outstanding. Thank you!" "I work in a pediatric dental office and the Film Flaps, (Original), are great for kids. Many of my patients say they are much more comfortable." "These Flaps (Long) save time and are very easy to use"
"Our patients are very happy we are switching over from the cardboard stick-on-tabs. Flaps, (Original), are much more comfortable!" "Flaps are very easy, simple, and fast to use. Plus, patients don't gag like they do with other devices." "I like Flaps, (Long), so much that I ordered and paid for these personally. Thanks for a great product!" Blue Cushioned Bite Tabs Click for Flaps samples..
White Cushioned Bite Tabs Click for Flaps samples..